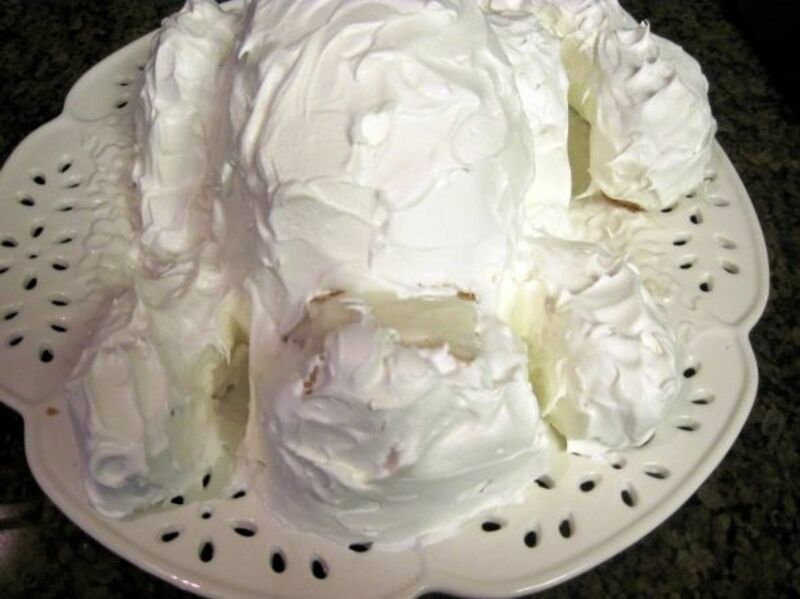 Decorating a kitty cat cake is really fun and easy! Since my daughter loves kitty cats and I love my grandkitties, it seemed only appropriate that we decorate a kitty cat cake for my daughter's birthday. 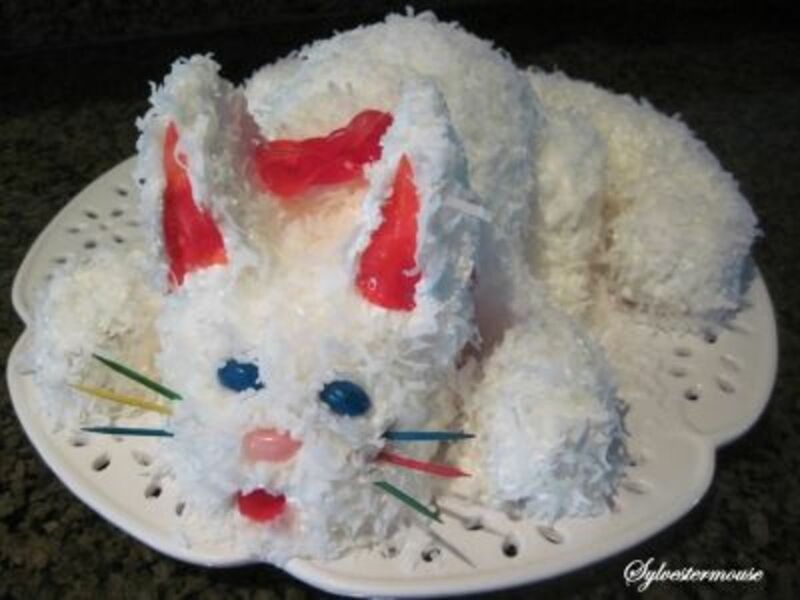 Making this kitty cat cake is simplified by having the design template pictured below and the step by step instructions on how to make a Kitty Cat Cake provided in this article. You decide the cake and frosting flavor. 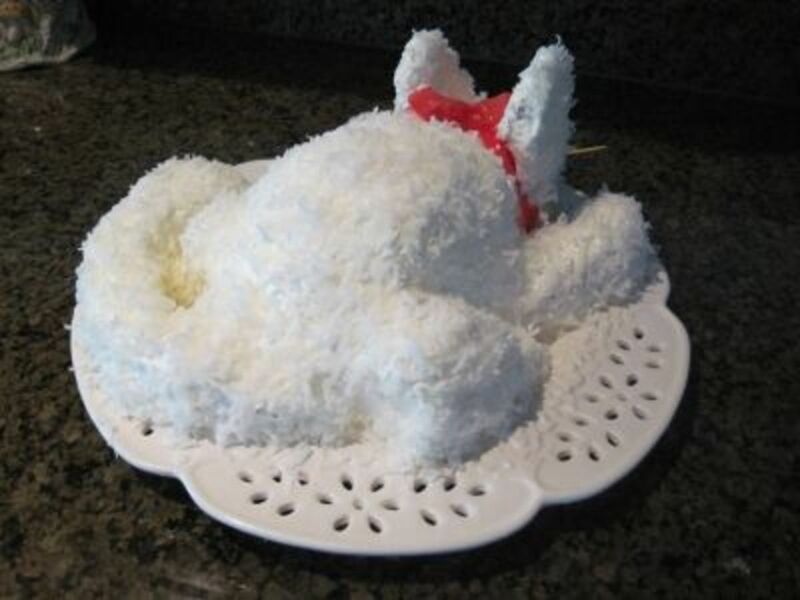 I chose to make a white coconut cat cake, but I plan to make a German Chocolate cat cake for Halloween. Of course, you may prefer a black cat for Halloween or a tabby cat for a birthday party. They would all be beautiful kitty cat cakes! Since this article is about decorating the cake, we are going to start with the cake already baked, cooled and ready for decorating. 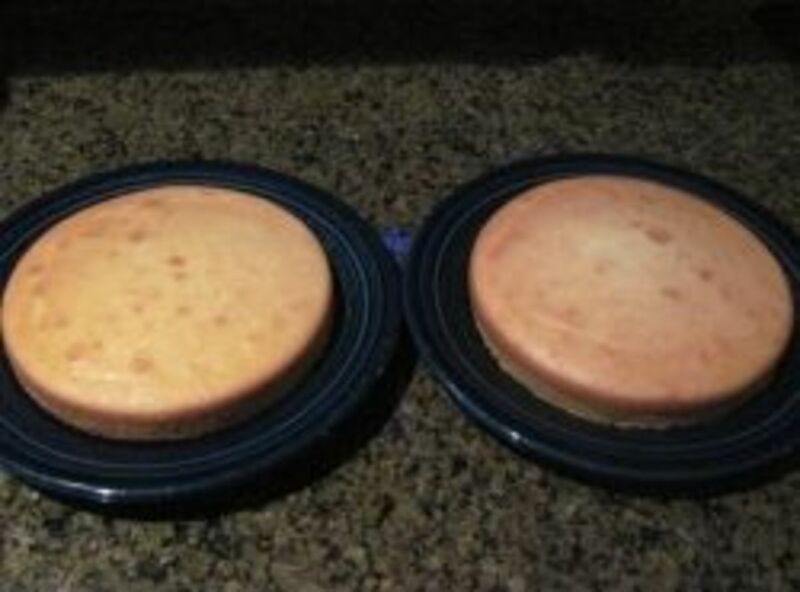 For the cake shown, bake the white cake in two 8" round pans. 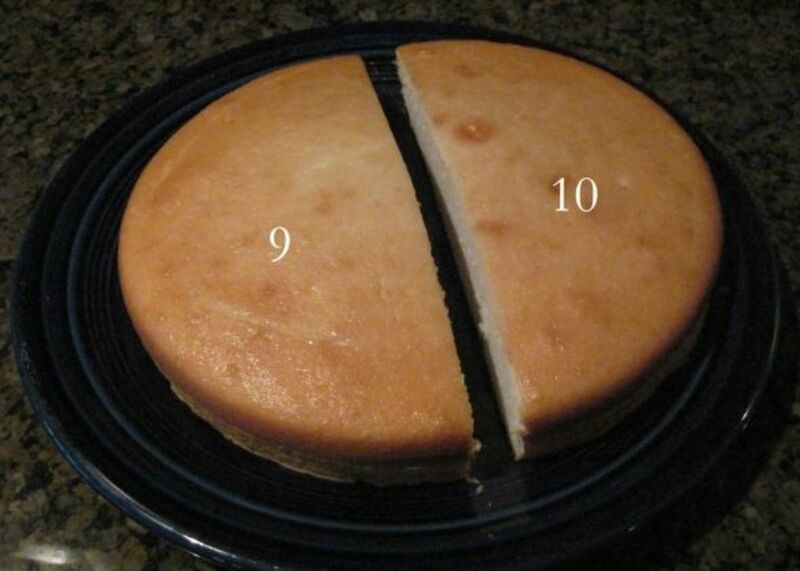 Allow it to cool completely before you cut the cake sections according to the cake diagram below. This is the brand I prefer to use if I am not using fresh coconut! Cut Cake Pieces are easier to Decorate if they have been Frozen for 1 hr. Apply frosting/Icing between each piece to hold them in place. Hold EARS (pieces 2 & 3) until first layer of frosting is on entire cake. 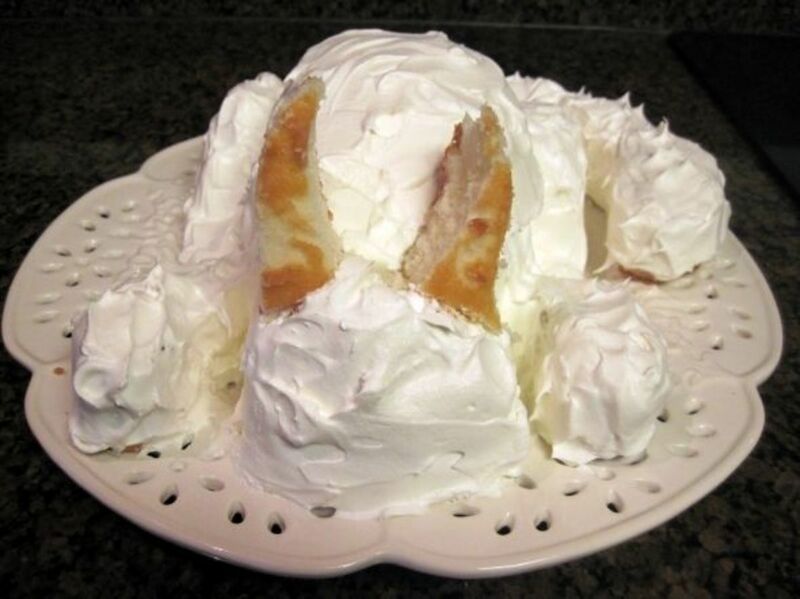 The frosting will hold ears in place on head. 1) Frost the entire cake with white icing. 2) Place Ears and Frost Ears. 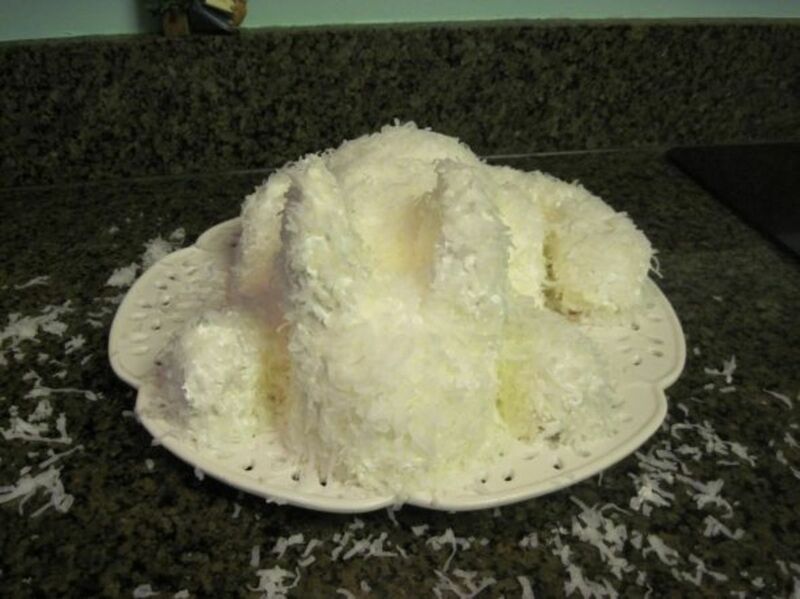 3) Sprinkle with flaked coconut. 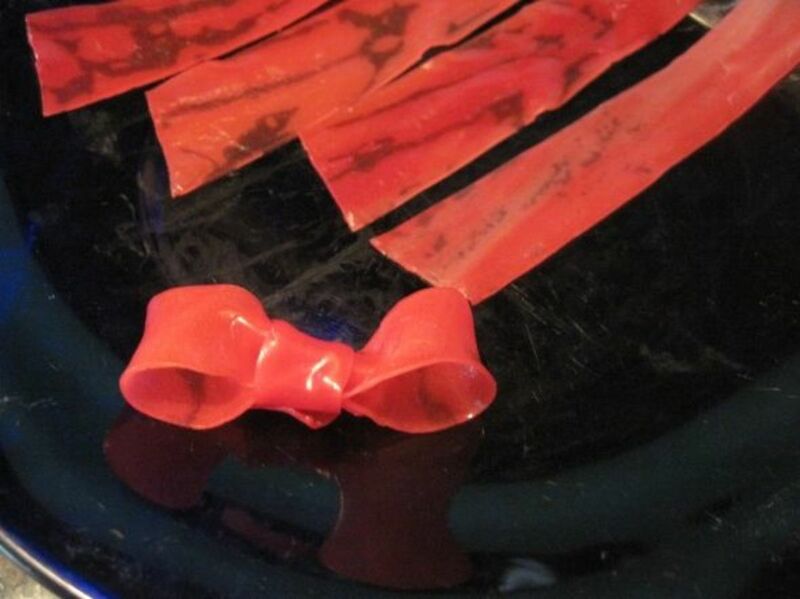 4) Make bow and ribbon on neck with Strawberry Fruit Roll-up. 7) Use a small piece of the fruit roll up for the tongue. 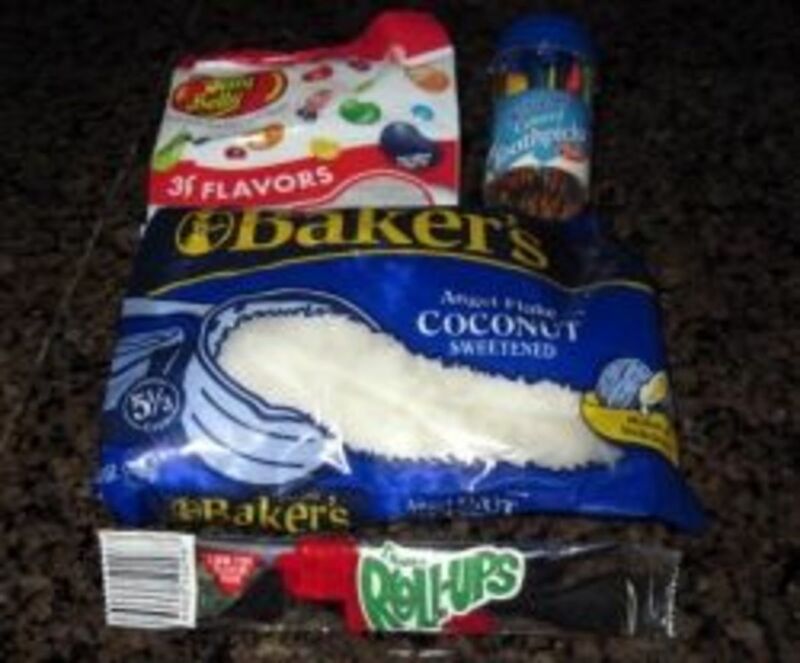 8) Place colored toothpicks for whiskers. Join Me Now for Kitty Cat Cake and Coffee! - Tell Me Please, What Color/Flavor Cat Cake Would You Make? Neomi Rios, unfortunately, I don't have a printable template. If I can find a way to create one for you, I will add it to this article and leave a new note (comment) that it is now available. How do I print the template? thanks! I think I'd have to do a black cat with green eyes - looks like fun! Such a cute cat cake! Sylvia loves your detailed instructions! That is such a cute cat cake! My daughter loves cats, as do I. It'd be nice if she also liked cake and coconut. Wow this is so great! I know my sister in law would adore this - she has a big ginger cat, so I might try this out with some food colouring... Might end up as a disaster but worth a try! 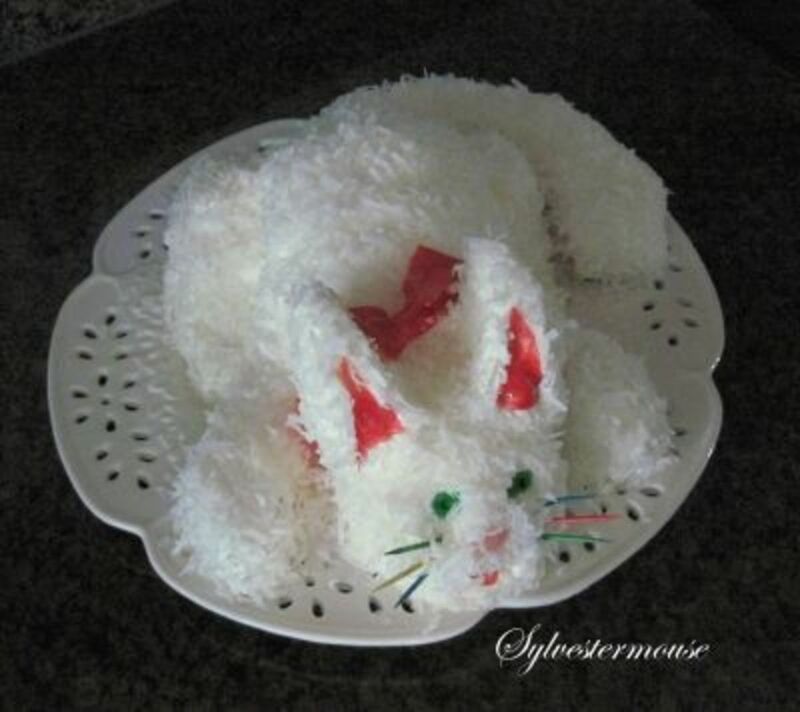 Oh, goodness, how cute this cat cake! But, I have my dog Tidbit here beside me and she wants a black chow cake too! I think I would go with the white one in your photograph. You made this look very possible! Nice job! That is so gorgeous and very, very doable I think. Returning with a fresh angel dusting for your cute kitty cat cake....and now for a cup of that coffee you just reminded me of! Awesome I'll Have to make that for niece some day. She loves Hello Kitty. Kitty Cat Cake is very cute to look, here are nice instruction for making Kitty Cat Cake, Thanks for this. We're invited for a children's party on Saturday- this kitty cat cake would be perfect to bring! Adorable! I like my cat, and would enjoy trying to duplicate her dark tabby coloring in a cake... probably a chocolate cake. I have a good buddy who is closer with his cat than any human-cat relationship I've observed before, and he celebrates his cat's birthday with a full-scale party every year. I bet he'd go bananas for a kitty cat cake! In fact, I'm kind of surprised he hasn't done something like this already. What better food for the humans in attendence at his kitty's birthday? As an interesting read, I recommend it to my lenses. Cute cake and love the step by step visuals and info! Too adorable! I'm thinking a carrot cake, since you asked. Some of the things I treasured most while growing up were the custom cakes that my mother made us for special occasions. Love your kitty cat cake. Congrats on your feature and Purple Star! wow fantastic decoration of cake.. SO AWESOME! Totally making this for Halloween, just need to figure out black frosting! That's fantastic! 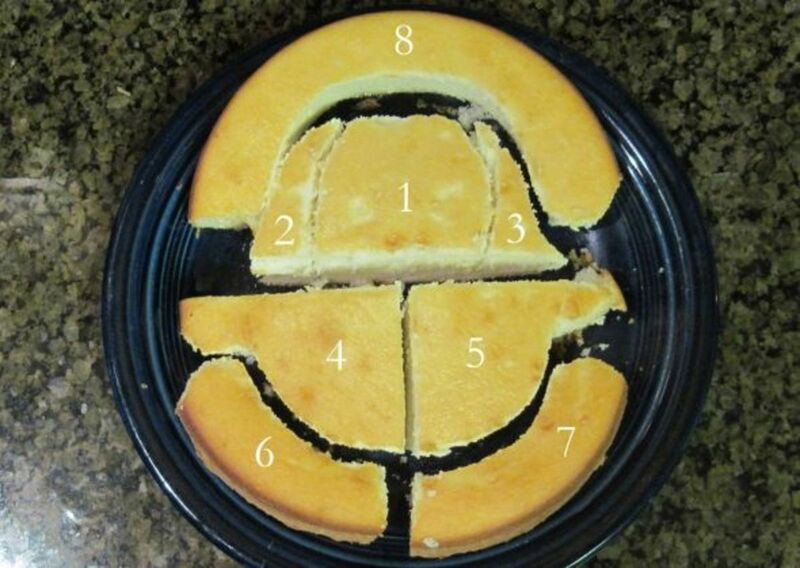 And the hardest part about it is cutting the cake - and you even have a template for that. The nearest I have ever got to making a decorated cake was to make a chocolate log for Yule! My eldest granddaughter would love that. Coconut sounds good but chocolate is my favourite. Wow! super cute. 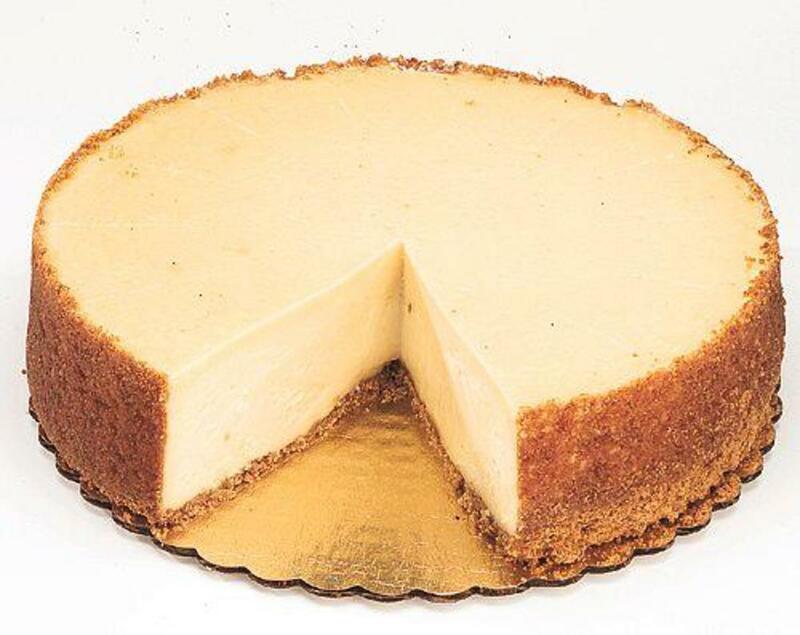 I've never made a shaped cake before, but I would love to. Wow!!!! Now THAT is cute!!!! I am going to try this.. wish me blessings!!!! And here are some blessings for you, too!!!! What a very clever thing, it is way too cute to eat, wonderful baking. Congratulations on your purple star and front page honors as well. I LOVE that sylvestermouse is making us eat a kitty. ;) But I especially love the instructions. I think I could do this and I have a girl who would love it. Thank you for sharing this. I just loved this in July but wanted to congratulate you on your home page honors and purple star on the purr-fect sweetness! cute cat, i like this idea.. So very cute! I think I fancy a lemon kitty. This is so cute. I love that there is no special cake pan needed. 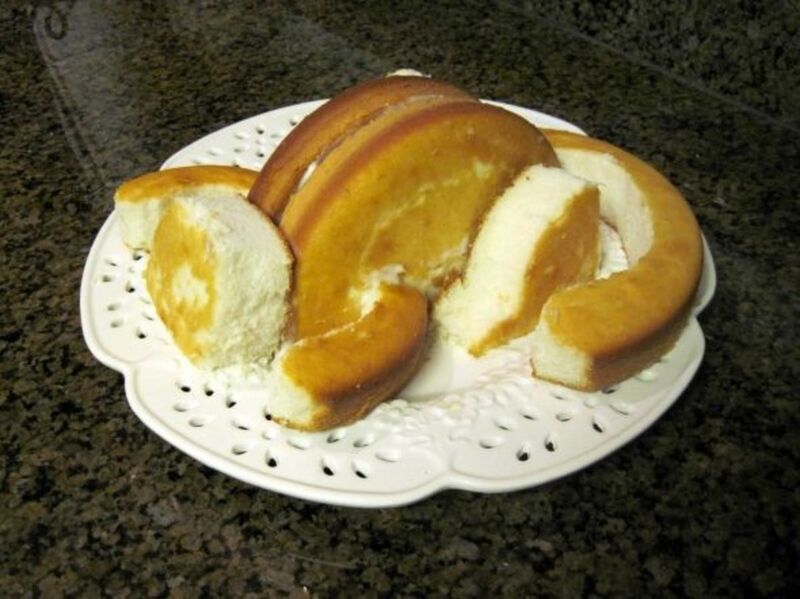 This more like what we used to do to make theme cakes -- before there was a cake pan mold for everything. Thank you! Chocolate orange cake, tabby cat! Oh my goodness, I would be so delighted to join you for kitty cake and coffee!! I have to post this lens on my Tingaling lens (she is a white cat). How cute! 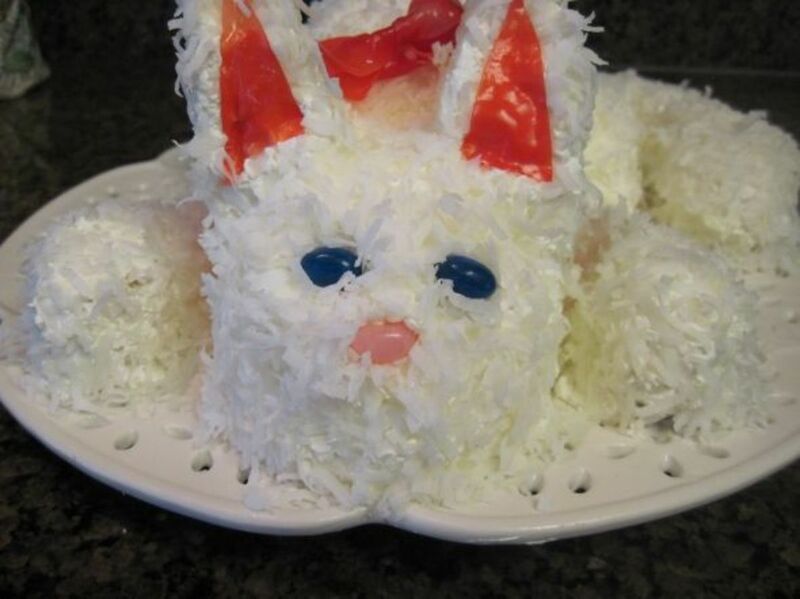 I make a bunny cake that is similar with loads of coconut. My problem is that it's hard to eat such a work of art. Well, maybe just one bite? I have nothing but admiration for anyone who has the time and patience to create these spectacular cakes. And then they get all gobbled up in minutes! Gorgeous Kitty Cat Cake and great instructions. Found your lens on Pinterest. I got one word - Catastic! I am saving this to make someday. 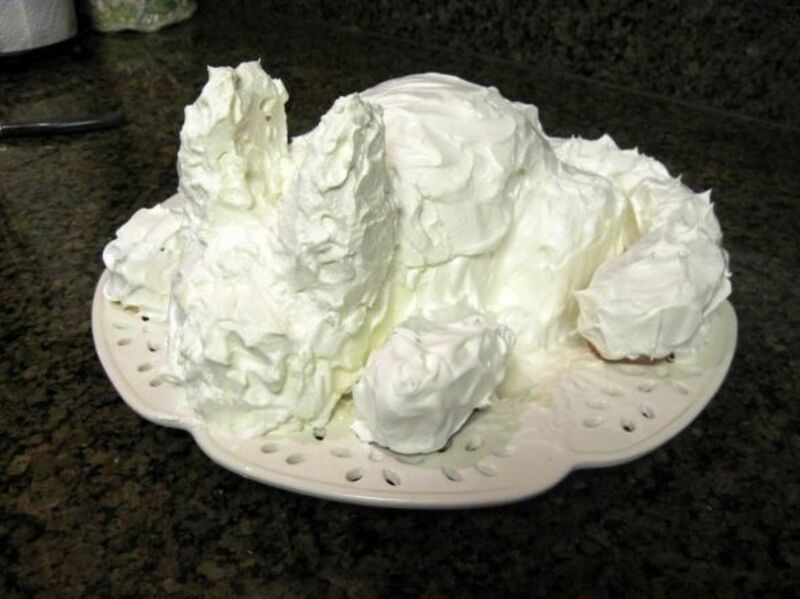 Your intro picture just made me want to cuddle that kitty cat, it looks like he or she just flopped down and is the cutest kitty cat cake ever with perfect and easy to follow DIY directions and pictures to guide us along. That is just too cute! 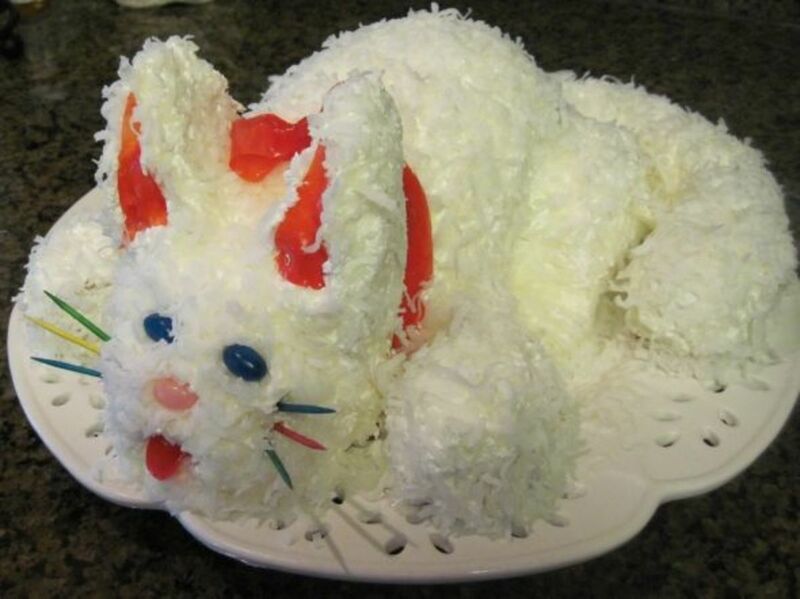 How would you ever bring yourself to cut into a kitty cat cake? I'd want to keep it just to admire. 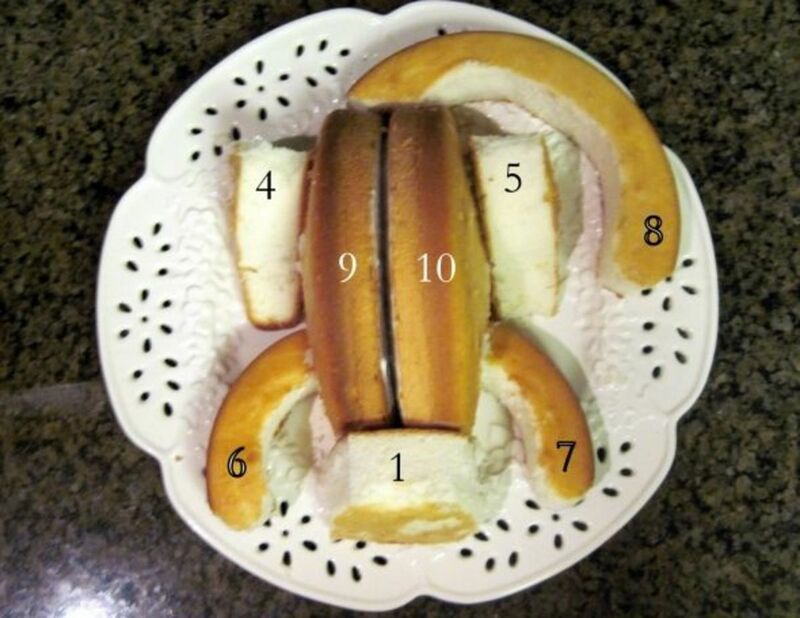 What a wonderful cake and your instructions are so good that I think even I could do it. Definitely chocolate. Would it be too weird to have red velvet? Oh so fun! I DO want to make one. Let's see - white kitty, lemon-flavored! I may have to come back here when my wife's birthday rolls around. 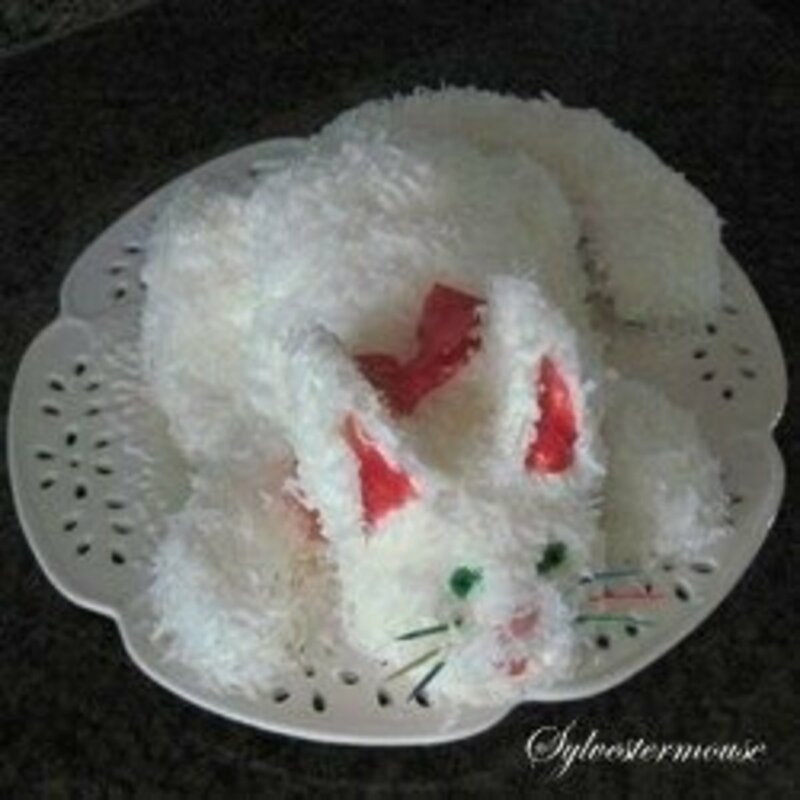 I've seen bunny cakes that are similar, but I think that I like this one even more... that is adorable!! Oh so cute! 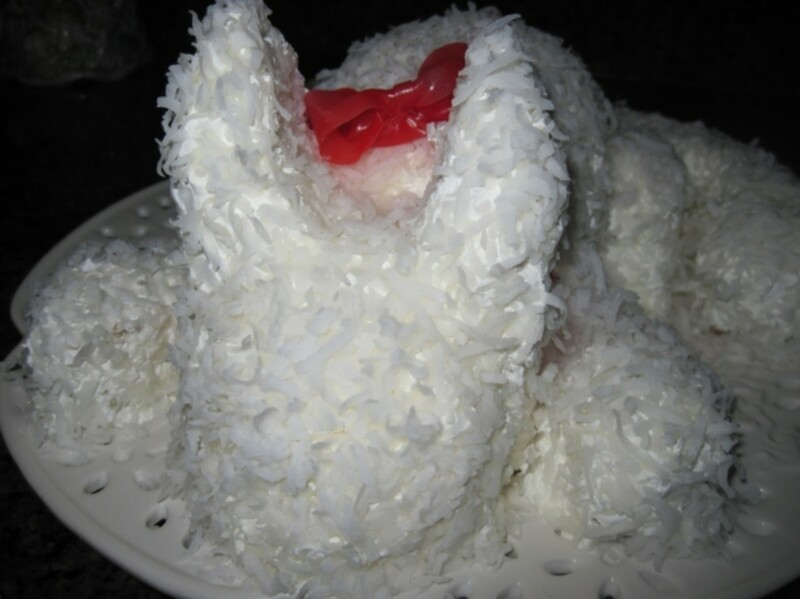 A kitty cat cake would be fun for birthdays or baby showers, too! Yep - I'm on my way over! Kitty cat cake and coffee sound just perfect right now! 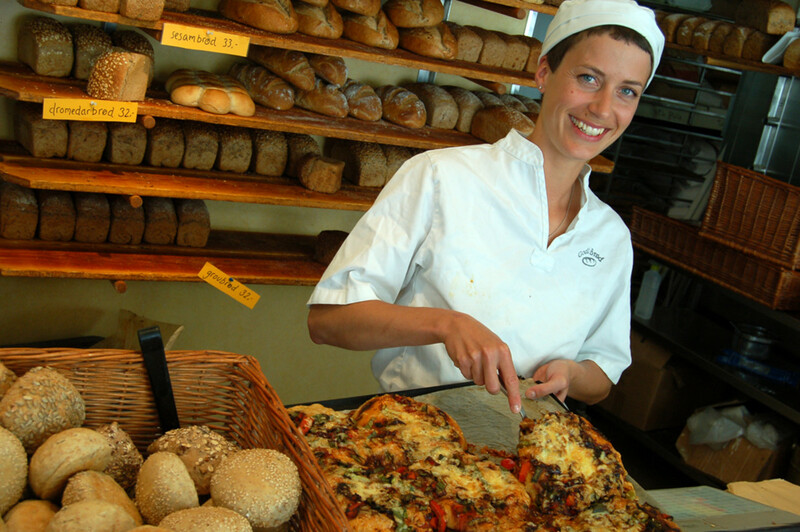 But, I don't want to mess up that beautiful creation! How about we eat MY attempt at it?? Oh your kitty cake is absolutely gorgeous. You are so creative. I could not figure out just by looking at the image how you could have made a 3D cat cake but seeing your cuts and step by step instructions really made it look easy. You are a rock star girl. This cat cake is adorable! You make it look so easy! My Gosh! I think you can duplicate any animal, vegetable or mineral! This is gorgeous! I love your simple step by step directions and all the photos so that I won't make a mistake. You are the queen of tutorials! 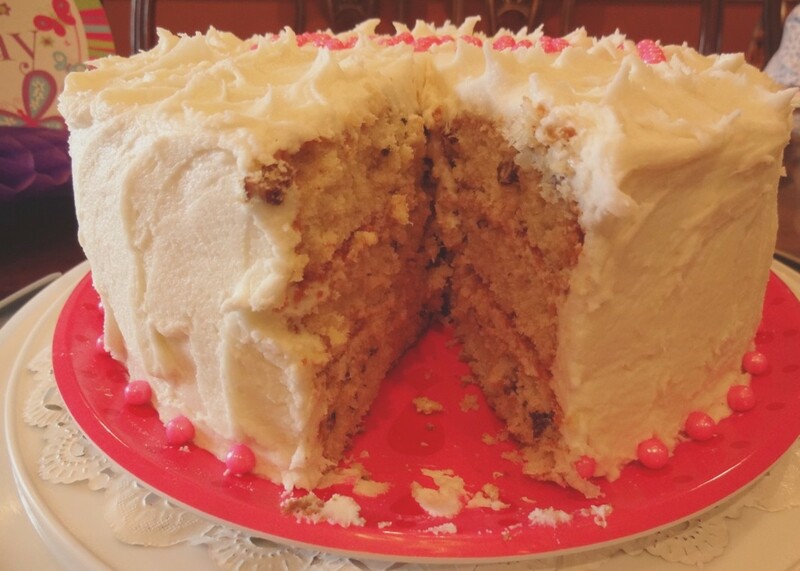 chocolate cake, white coconut icing like you have here, yum!!! I want a Kitty Cat cake now! What a work of art! I love chocolate cake. 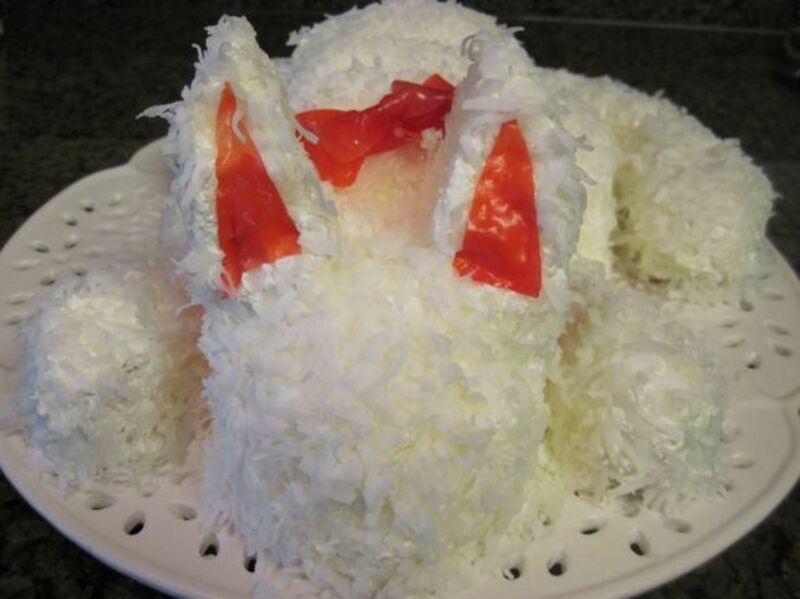 It wouldn't take much to make that pretty little white kitty into a friendly dragon :) What a beautiful cake. I'll bring the coffee. Save me an ear!